"Garden road walking corps" walks around the garden highway from today! Everyone of the "Garden Road Walking Corps" walking around the Hokkaido Garden Highway, about 200 km in length, entered Asahikawa today and stopped by Ueno Farm. From tomorrow I'm going through Furano to Tokachi in 2 weekly stages and going around all the gardens. 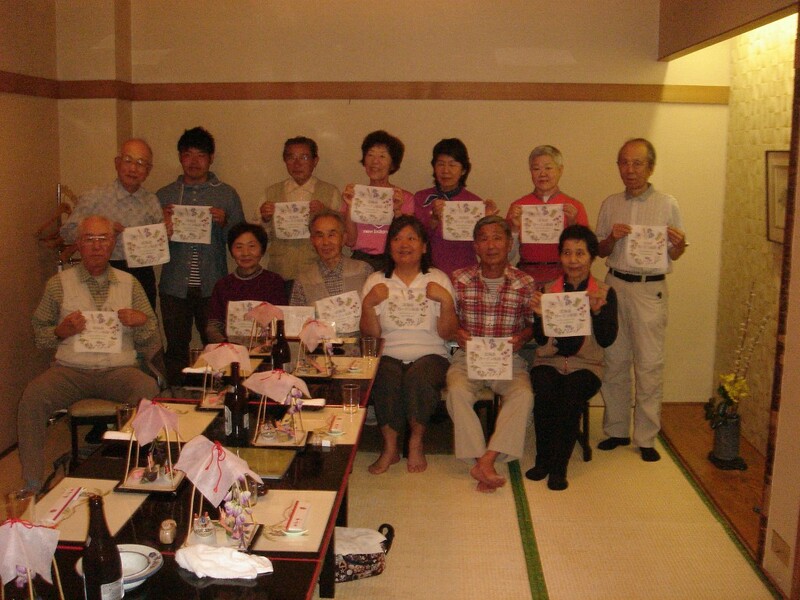 Tonight, departure ceremony was held at a Japanese restaurant in Asahikawa city, it is a picture at that time. All of us, Hokkaido Garden Highway officials, will welcome you warmly! 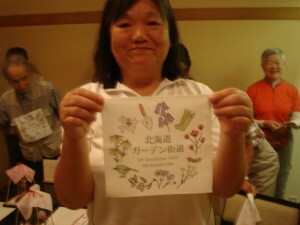 Thank you for your encouragement if everyone also sees the people of the "Garden Road Walking Corps". Since it has a round logo mark number on the garden highway, you should soon see! Profile of "Garden Road Walking Corps"
It is made up of fellows who enjoy walking long distances such as Nakasendo, Kumano ancient roads and Shikoku Pilgrims. It was able to complete "Hokkaido 1 turn" over 3 years from 2007 to 2009 year. I was able to get approval and decided to hold it. If necessary, I would like to keep saying "Garden road walking corps". We will gather in Asahikawa on June 12 and break up in Obihiro on the 25th after about two weeks. In the meantime, I plan to move by walking around the seven gardens. We decided to proceed with the plan. I would be pleased if you can support everyone.